D4000 Laser/LI-1000 Database Download Kit. Cable and instructions for downloading a database look up into a L-1000 barcode verifier or D4000 Laser (firmware A.05 or EARLIER). CR2 Laser Scanner, D4000/L1000. NOT entire barcode verifier. Replacement part or add-on only which REQUIRES customer already has (Part# 002-7850) or (Part# 002-7851) or (Part# 002-7845). For NIST traceable ANSI method and/or laser point-and-shoot type operation, the Inspector Model D4000 adapts to practically any linear barcode verification application requiring a portable unit. The D4000 offers the ease of point-and-shoot traditional verification with the laser optic and the most flexible ANSI method verifier with the patented Auto-Optic. 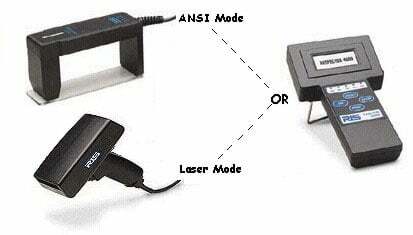 Choose the laser optic, the Auto-Optic or both. Whichever method is best for you, the D4000 provides flexibility. Use the laser optic for cylindrical products, easily wrinkled or scratched surfaces and wet ink. Use the Auto-Optic for exacting ANSI method verification. This patented device gives the user a choice of two light sources and four apertures through its easy to use front panel. You can meet practically any application with the D4000 from RJS. 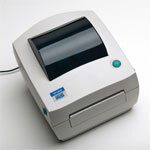 A D4000 incorporating an Auto-Optic scanner is the industryâ€™s most flexible ANSI method verifier. Eight optical arrangements are possible via menu selections for four aperture sizes and two wavelengths of light. The optical geometry meets all requirements of the ANSI X3.182 Barcode Quality Guideline. The Auto-Optic scanner is designed and manufactured by RJS for the sole purpose of performing ANSI method barcode quality analysis. Repeatability between units is outstanding, making the D4000 an ideal choice as a standardized company-wide ANSI method verifier. A D4000 incorporating a laser scanner is an extremely easy to use point-and-shoot verifier. It requires virtually no user training and analyzes most of the essential traditional verification parameters. It also provides the ANSI method Decodability calculation and percent of decode information. Popular applications include verification on materials requiring special considerations such as shiny, curved or uneven surfaces and wet ink. This unique portable barcode verifier can interface with either the patented RJS Auto-Optic scan head or a laser scanner to provide nine different optic configurations. The scanners are easily installed by the user, which makes the unit quickly adaptable to practically any verification requirement. A D4000 incorporating an Auto-Optic scanner is the industryâ€™s most flexible ANSI method verifier. Eight optical arrangements are possible via menu selections for four aperture sizes and two wavelengths of light.Â The optical geometry meets all requirements of the ANSI X3.182 Barcode Quality Guideline. A D4000 incorporating a laser scanner is an extremely easy to use point-and-shoot verifier â€“ basic scanning instructions are placed on the scanner. 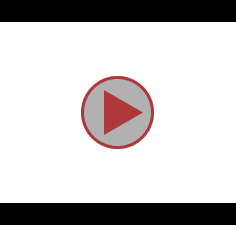 It requires virtually no user training and analyzes most of the essential traditional verification parameters.Â It also provides the ANSI method Decodability calculation and percent of decode information. Popular applications include verification on materials requiring special considerations such as shiny, curved or uneven surfaces and wet ink. High density codes with X dimensions as narrow as 5 mil (.13 mm) can be also analyzed.